Lalex 1938 Forme, M nib, shiny, pearly bargain. Review/quick peek here. Lamy Safari/Vista EF/1.1 mm/1.9 mm Classic and affordable. Original. Review here. Pelikan M425, EF - Art Deco in Silver & Green  - an early review (crappy photos) here. Pilot Vanishing Point, F - a portable, chubby dolphin. Review here. 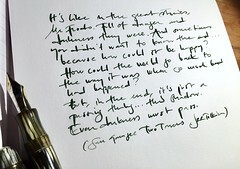 Stipula Suprema Pelago,F, With a gigantic ink tank Review I here. Review II here. Yard-O-Led Viceroy Lined Grand. Lovely simplicity in sterling silver. Review here. Hi there!! So far I’ve been readig your blog.. It looks very nice.. It’s a curious case of mine… Im a trained architect , I’ve been around And designing and building primarily unifamiliar houses.. And most of all fachades.. But then I decided to pursue a dream to become a pilot. Hahaha. Now Im doing my flying practices and I love it.. Now the case is that Ive always been interested in pens and notebooks.. And actually had the chance to buy few of them… Now Ive arrive to the point that Im so satysfied now I have a moleskine notebook… The classic one… And a jotbook Leuchtturm I use them primarily for 2 things… Writting and sketching my ideas for the architecture or anything I find interesting.. And to write down the flying practices info that I require to… For that Its very important to have a very functunal writting device which Ive found it in the Lamy safari fountain pen wich gives a thick dark-black-continious line.. Probably the only issue people could have is that of the thickness … Anyway it gives the sketchy style… Love it… Sorry for the redaction style English is not my native lenguage … Saludos from Guadalajara Mexico.. I hope I could get news from you at mail… See you..
No, I haven’t – so far.